Kirk and Spock had it easy. Out there, in the cold expanse of the final frontier. Drawn together as they explored strange new worlds and new civilizations. Just the two of them, after that red-shirted extra dies horribly within the first 10 minutes - alone, miles away from home, free to "boldly go" wherever they wanted. Fans of the series know, of course, that their love would never be. Kirk was too busy seducing green-skinned women and climbing mountains, and Spock was occupied with the full-time task of being half-Vulcan: the mind-melds, the nerve pinches, the immaculately tweezed eyebrows. But their friendship nonetheless inspired a wave of fanfiction, collected in zines like 1967's Spockanalia, much of which had a very different take on the matter. One of the liberating aspects of fanfiction is its removal from canon and continuity - often fanfiction deals with idealized dream scenarios, playing out in ways that original stories did not or could not. And so the intrepid cast of the Enterprise boldly went someplace else entirely: to the forefront of "slash" or "shipping" stories, fanfiction that deals with pairing characters up in relationships that did not occur within the host work. But videogame canon is not necessarily as straightforward as that of text and video - there might not be one ending, but several, plotted out within a field of possibility. Sometimes this breaks down with a primarily "good" end atop a series of failed outcomes. Other times this range serves as a morality play, where systematized moral choices in game are rewarded or punished accordingly. And sometimes it lets your characters hook up. It's this matchmaking spirit that dominates Star Ocean: Second Story, a cult JRPG developed by tri-Ace that takes the "shipping" sensibility to new heights. The Star Ocean line of games combines science fiction with the more conventional fantasy stock of RPGs. 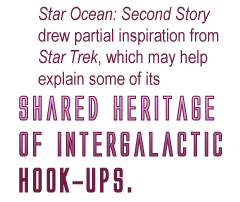 It drew partial inspiration from Star Trek, which may help explain some of its shared heritage of intergalactic hook-ups. When Second Story was released, it was billed as "the most vast RPG experience ever" with "over 80 possible endings" to unlock, though in reality there were a lot more - or a lot less - depending on your perspective. What the game actually had was thousands of permutations of over 80 short scenes, with most depicting a relationship between two player characters as they paired off after the final boss. Only a select few are shown upon the game's completion, requiring a series of exhaustive play-throughs to see them all. Between your choice of one of two protagonists and an assortment of 10 secondary characters, some of whom are mutually exclusive or available to only one main character, this lends itself to quite a bit of variation. Would your blue-haired heroine snuggle up to the dashing three-eyed alien archaeologist? Or maybe that luckless swordsman with the dragons fused to his shoulders would wind up with the plucky pointy-eared newspaper reporter? Weirder than the characters themselves are the matches that could spring forth between them. I know love is blind, but did anyone think to ask what the children might look like?